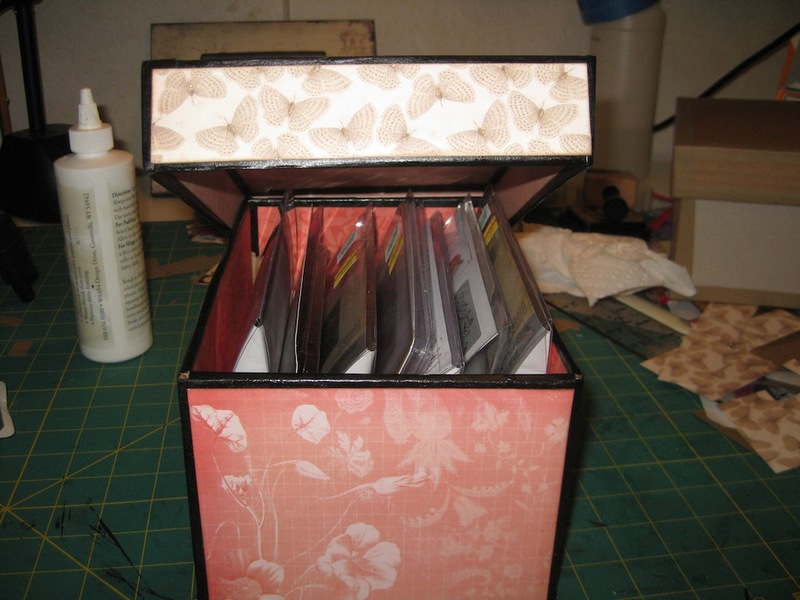 Do you remember the second box I made last week? The one that I tore stuff off? Here is a reminder if you don’t remember. 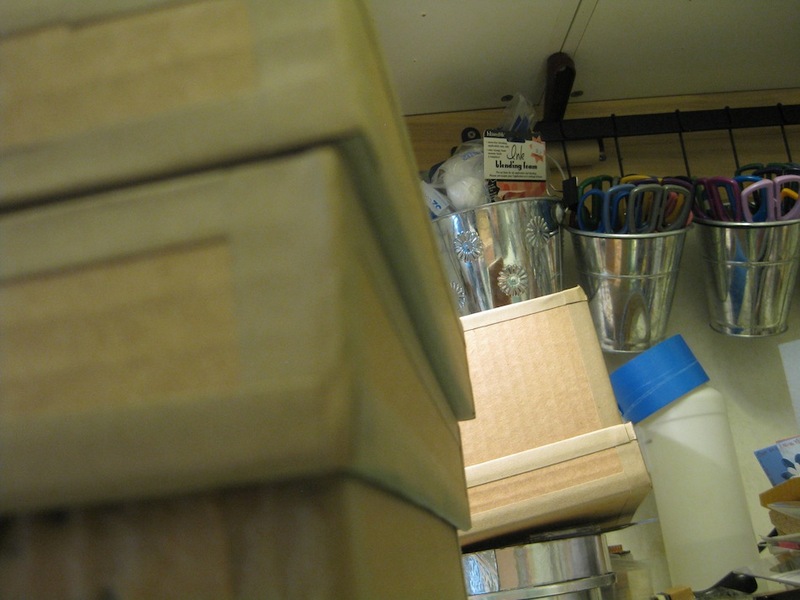 I only added a couple of “structure strips” to the places that had been damaged by my ripping stuff off. Added structure strips to areas torn away. 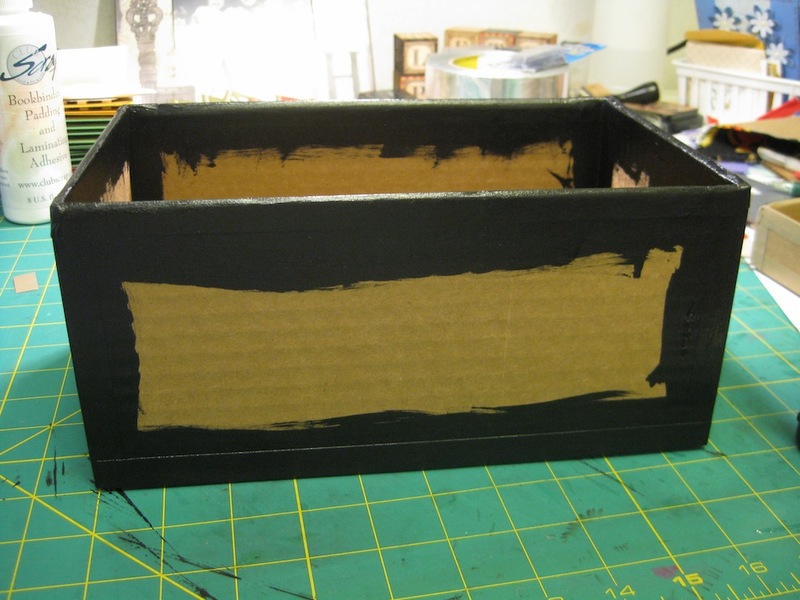 More black acrylic paint was slathered over the box edges, inside and out, of both the box and the lid. 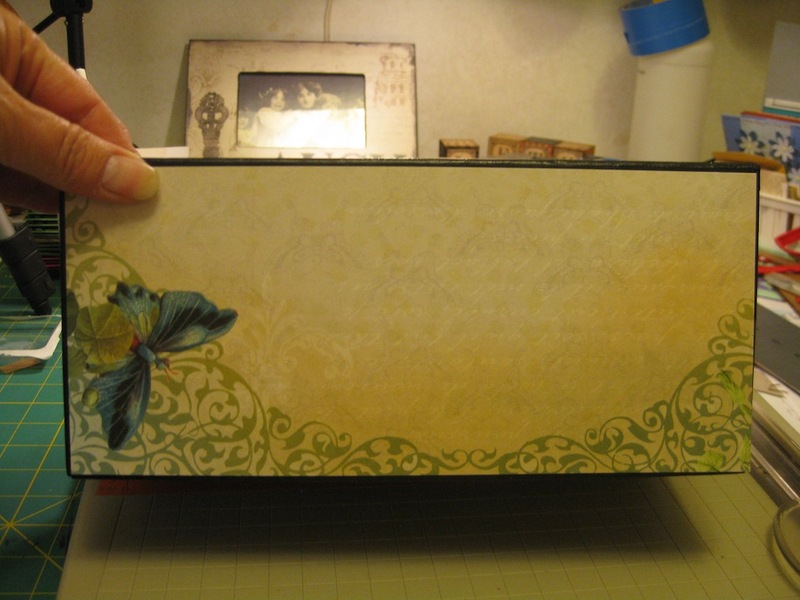 I’m using the DCWV Mariposa paper collection again. These two sheets will be the outside of the box. 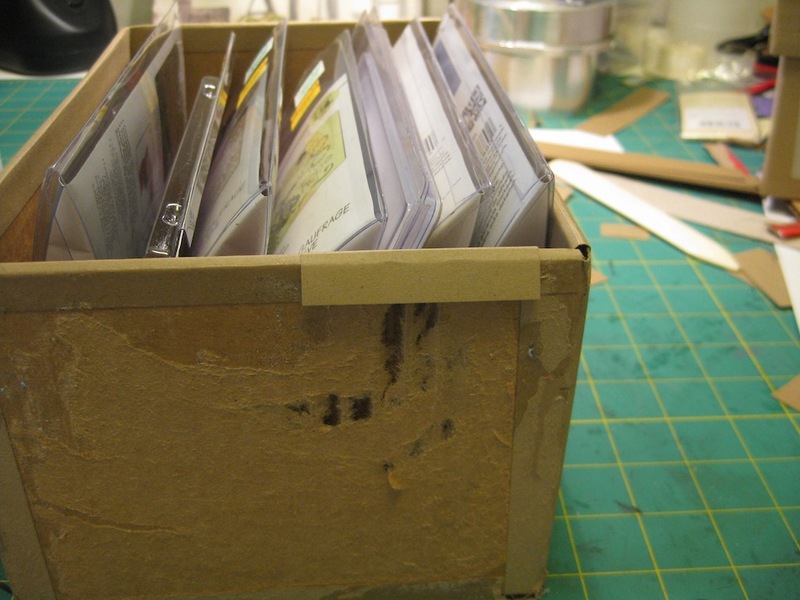 Papers for inside the box. 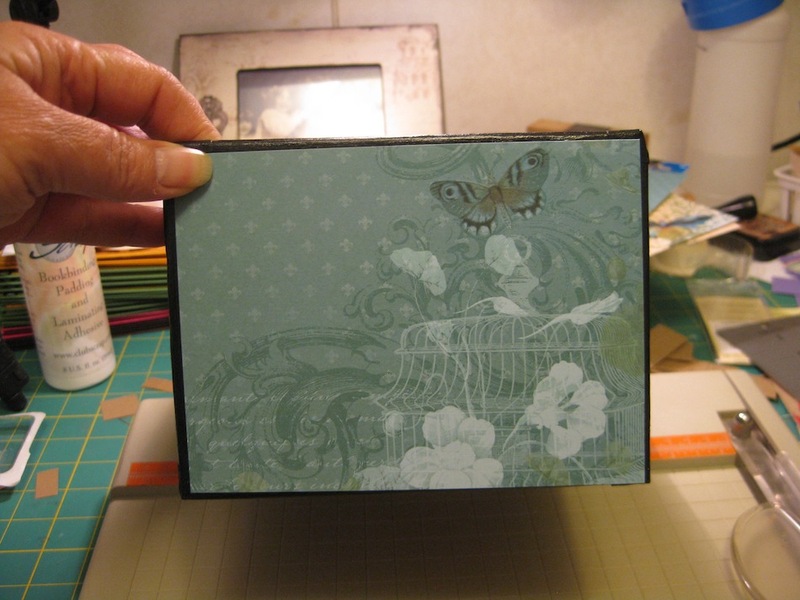 Using another sheet of paper from the DCWV Mariposa papers I covered the outside of the lid. These papers are supposed to be all coordinating and used together or independently. I’m not 100% sure I like this color scheme but I’m going to just live with it. 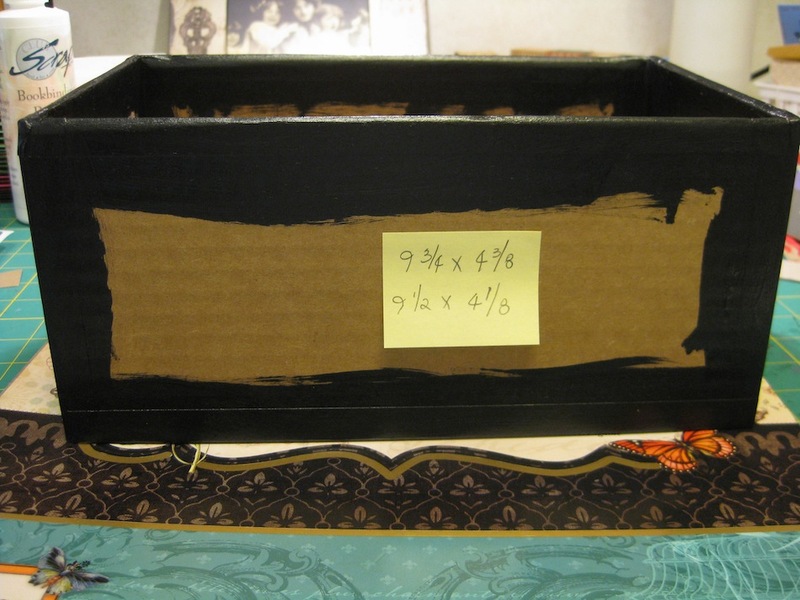 I really like the paper on the lid. 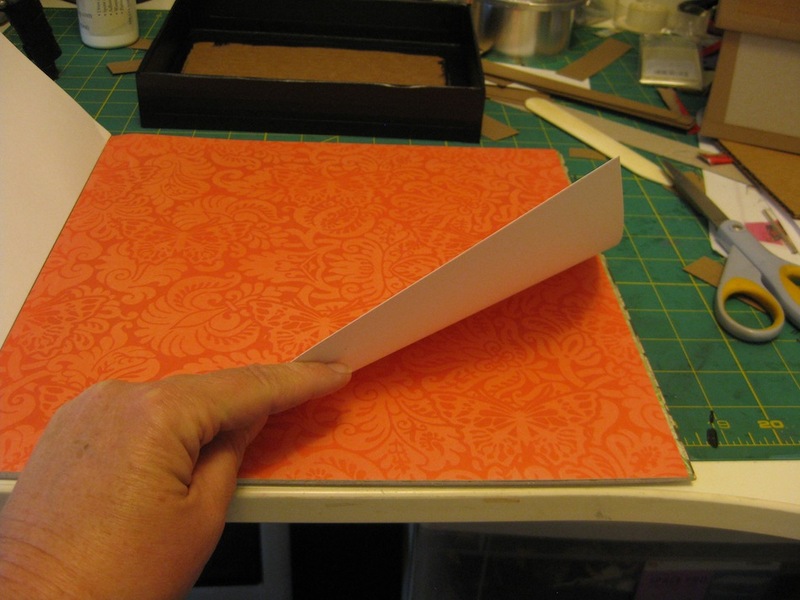 I’ve used this paper on other projects over the past four or five years. 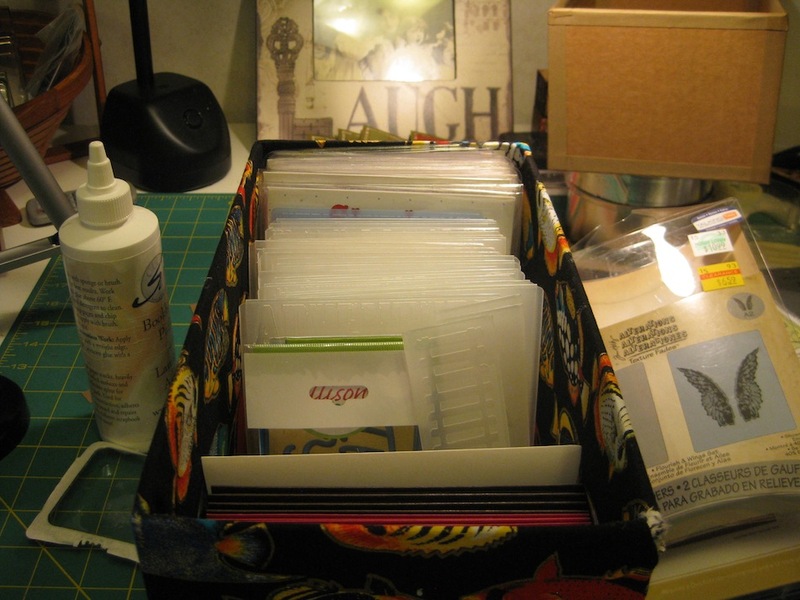 My supply is dwindling away to the point I’m not sure what Box #3 is going to look like The plastic packing I’ve saved for use with die cutting fits in this box very well. I’ve made a label for the front of this box. So I know what is in there. Moving my stash around every year over the winter…when I get back home from my truck driving I can’t remember where I put stuff. Hopefully….HOPEFULLY!!!! !…..that is done – finished – retired – and I will be home all this coming year. 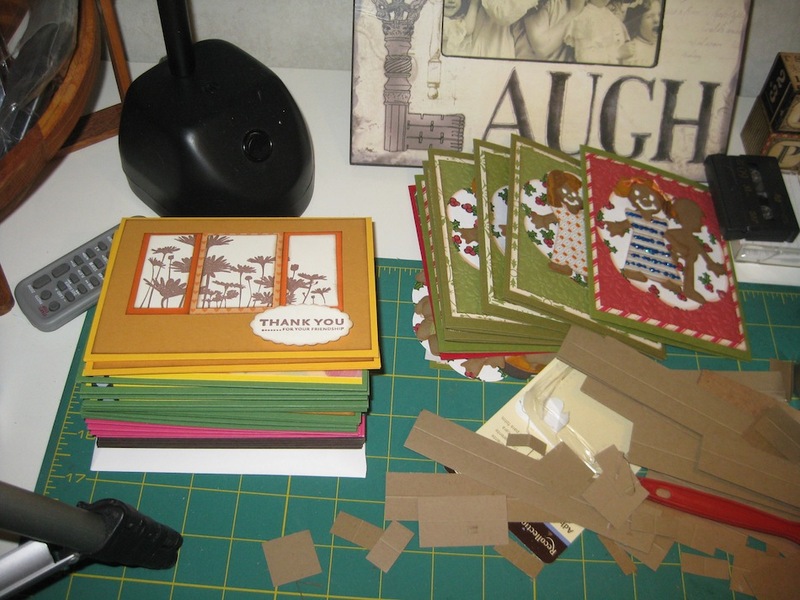 I have a Stampin’ Up! 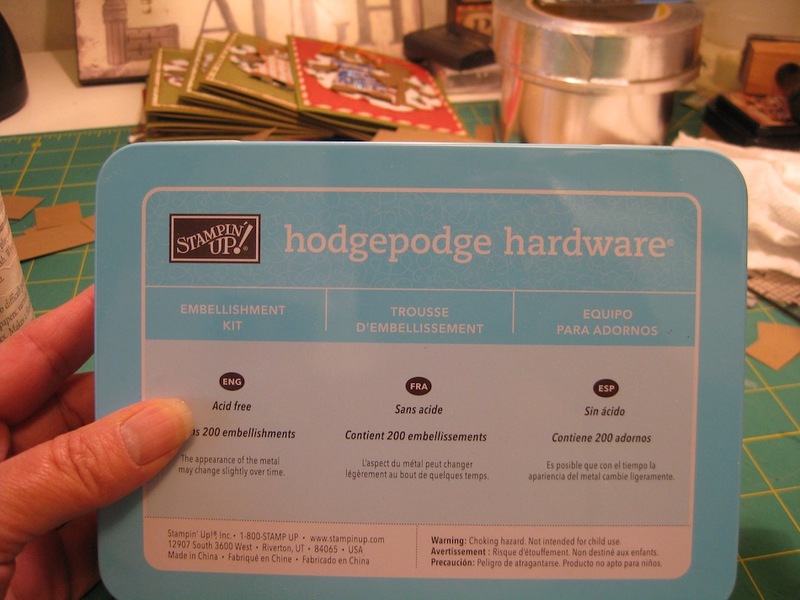 products called “Hodgepodge Hardware”. I don’t think this product is sold any longer. I’ve had this for about five years and it doesn’t get used. There are all sorts of goodies in this box. I’ve chosen the largest label thing-a-ma-bob for this box. 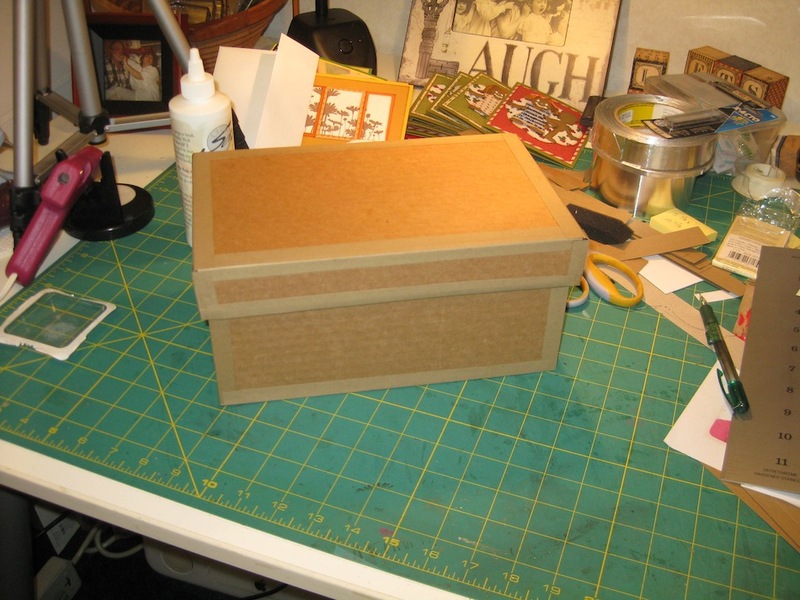 I used another one for the card box I made and I’ll show you that one at the end of this post. 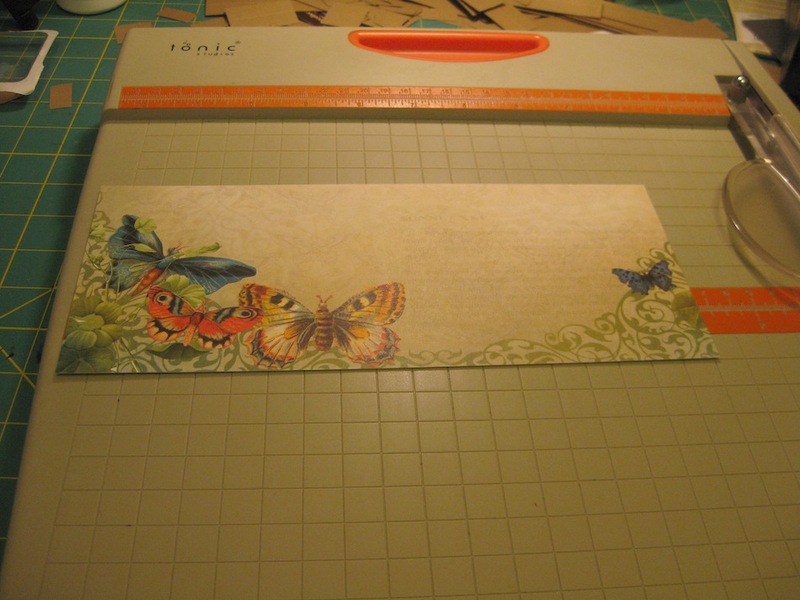 I drew around the metal piece on the back side of one of the Mariposa paper scraps and cut around it. 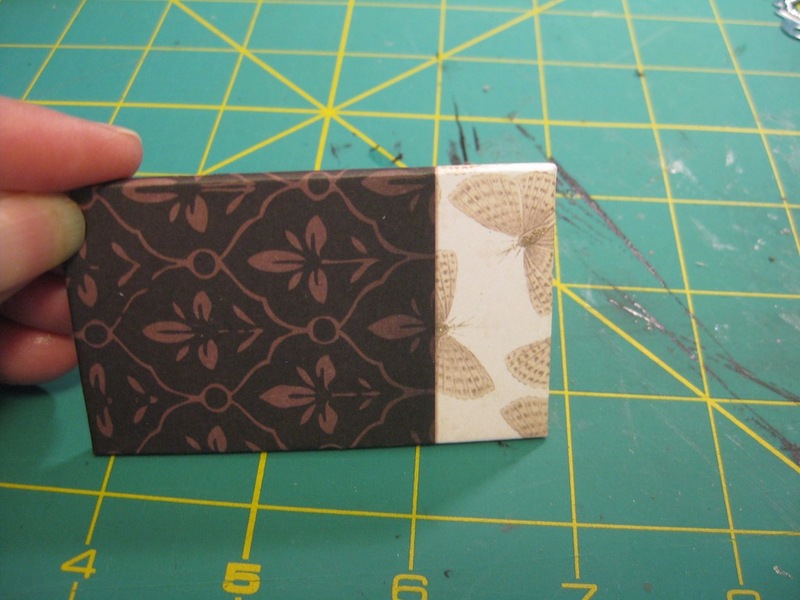 Using another scrap of the Mariposa paper I covered a piece of chipboard about 1/2 inch larger than the hardware piece. Mark where the holes will be punched. 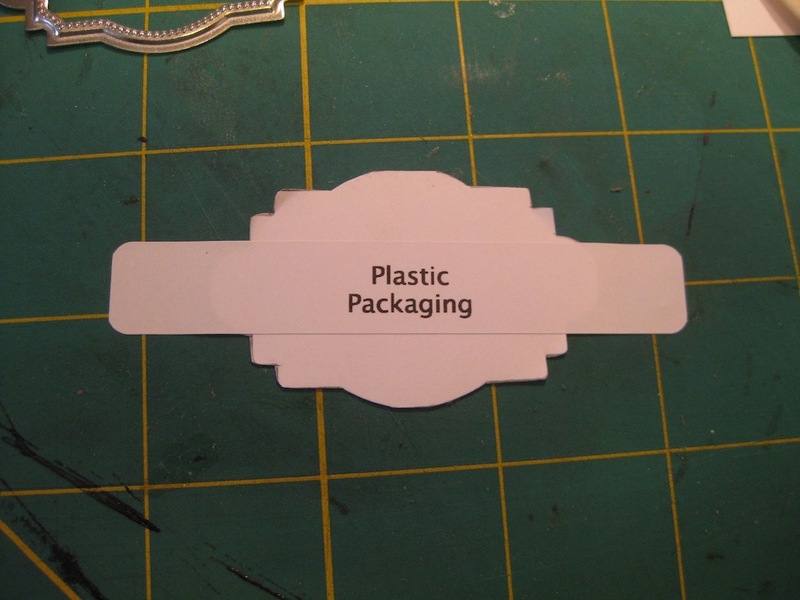 I printed a label from my DYMO LabelWriter to be a centered on the label piece. 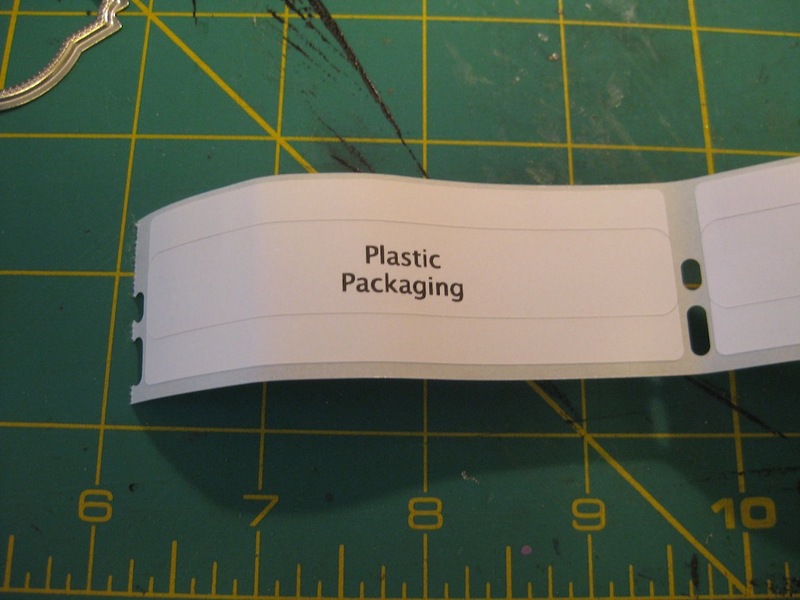 Now I can attach this label to the box with hot glue. Now I have two (2) boxes complete 😀 I’m pretty happy with how they have turned out. I like the brown with the pink better now. 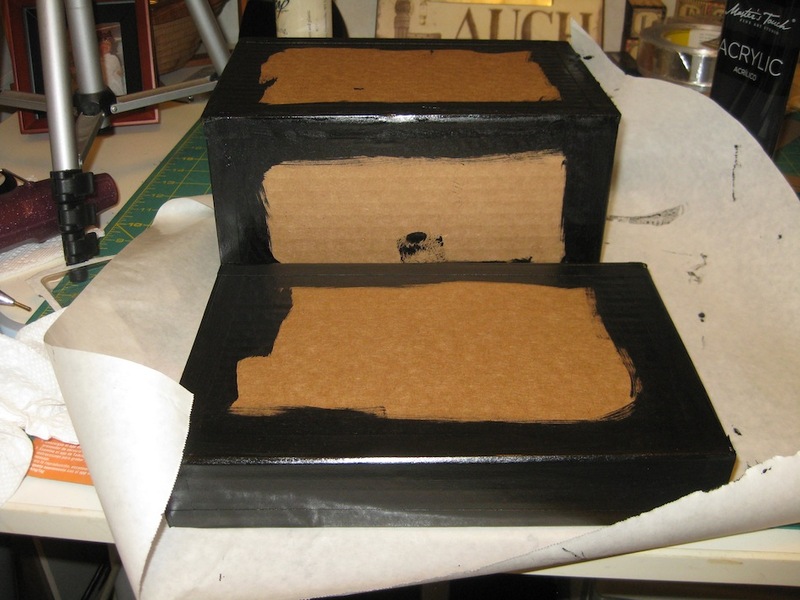 If there is anyone that would be interested in a video tutorial on making these storage boxes from scratch please let me know. If there is enough interest I will do it. The illusion of straight. And it is just an “illusion”! I have heard that “black hides many faults” and this time it came in so handy for me. 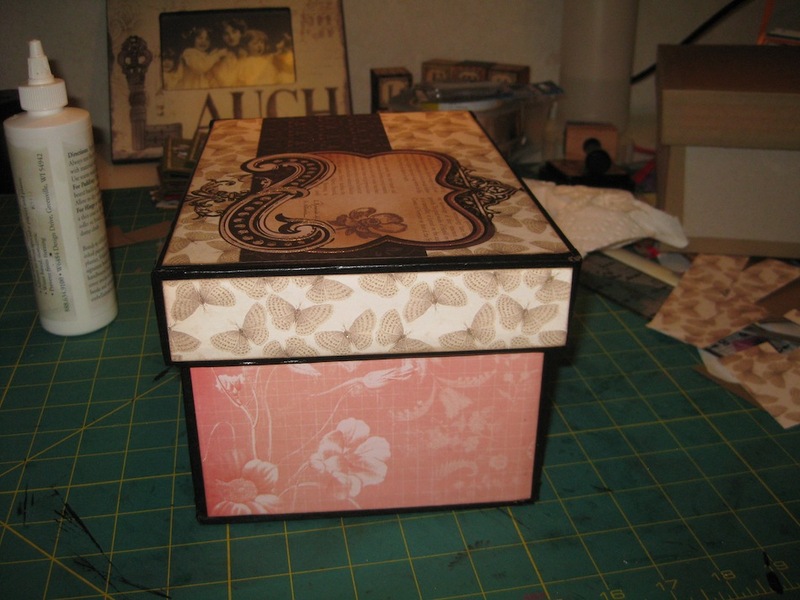 Although I am thrilled with the success I finally had in making BOX #3…..it is far from being square, plum, or even. 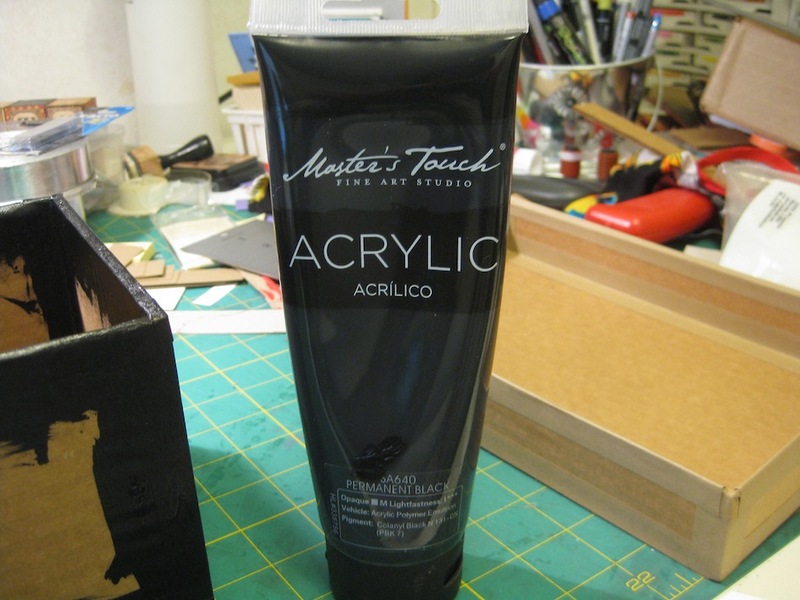 The paint I used is by Master’s Touch and I purchased it from Hobby Lobby in the aisle for serious painters. 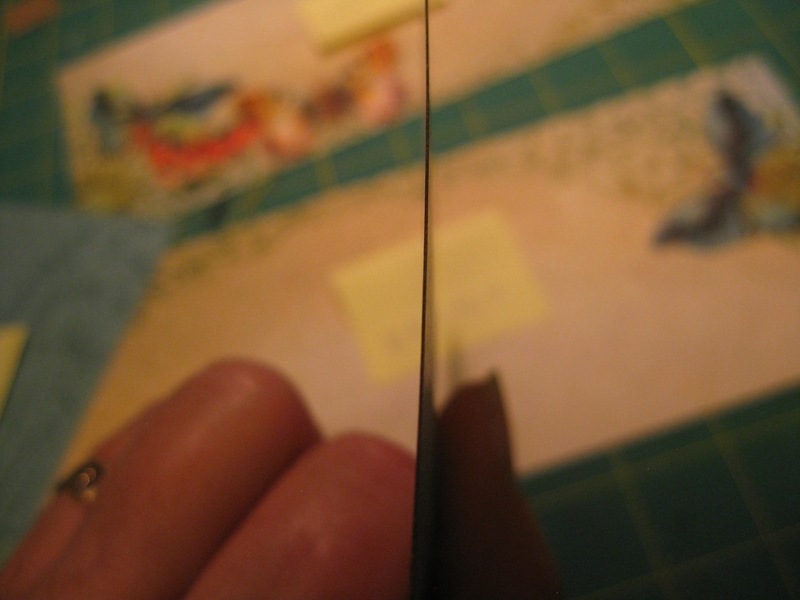 This is an acrylic paint that is very thick. I mean THICK. I had to cut it with water to make it more like the little bottles by Plaid or Folk Art. Let me tell you folks. This paint STINKS!!! This paint has a very strong odor. Unlike anything I’ve ever smelled before. 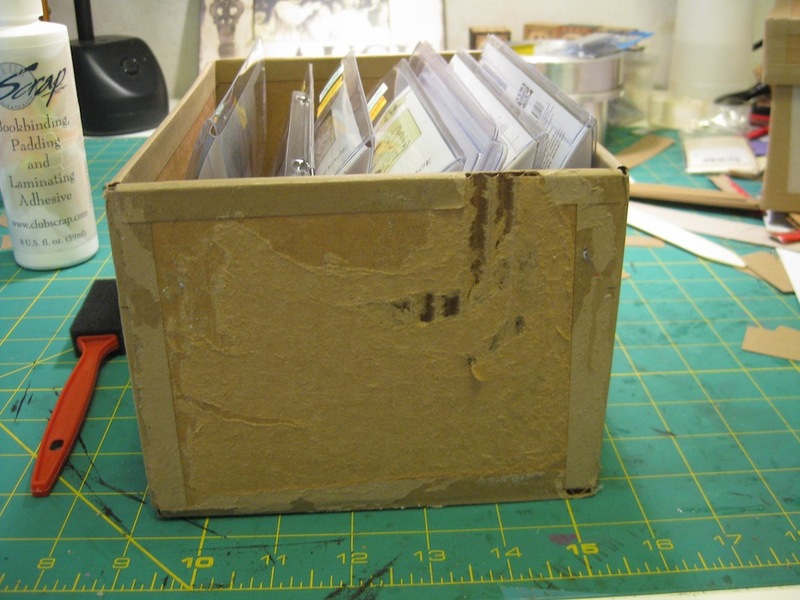 It has a fairly long “open” time…which just means that it dries SLOWLY! Even in a thin application. It is tacky for many HOURS after it has been painted. In fact, I had to leave it dry overnight before I got to the measuring part of this project. 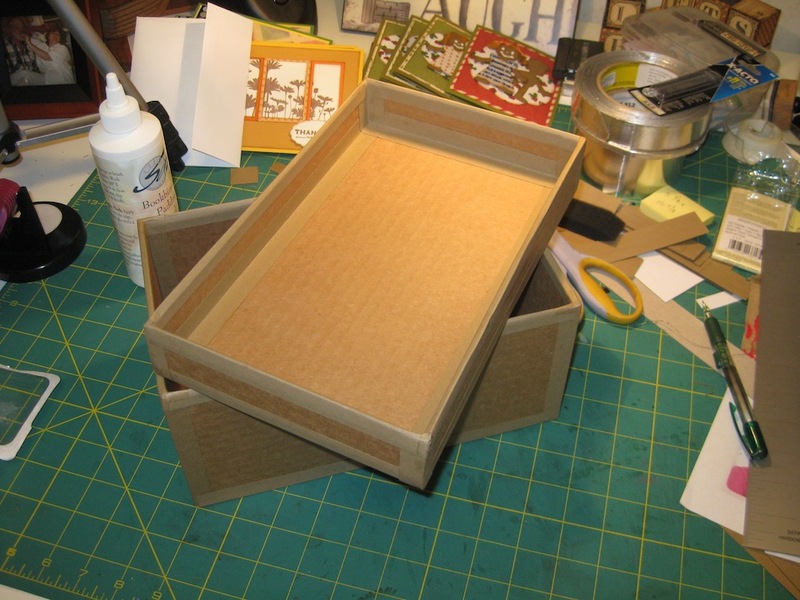 I had to measure each side…inside and out….on this box – and the lid. There are no two sides that are totally equal in measurement. You can see this by the left and right sides of the outside of the box. 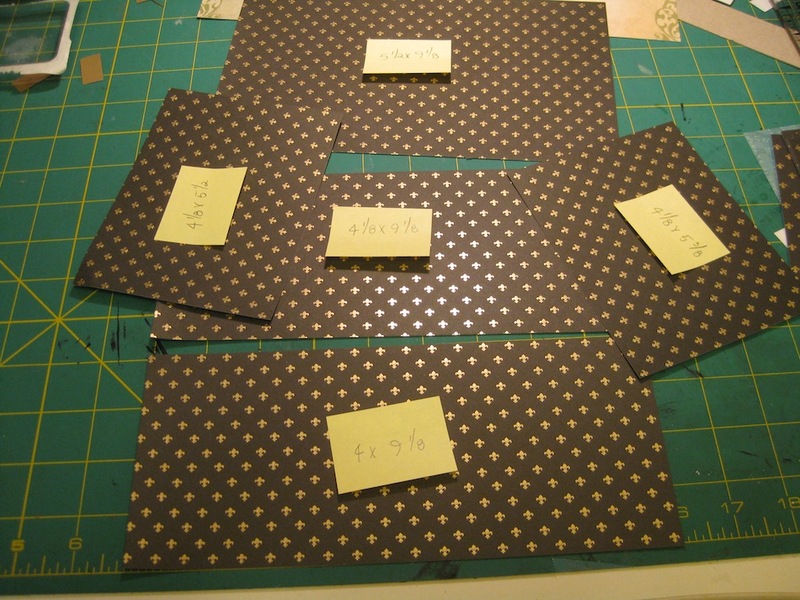 I had to hunt for my little pad of Post-It-Notes to keep track of each measurement. 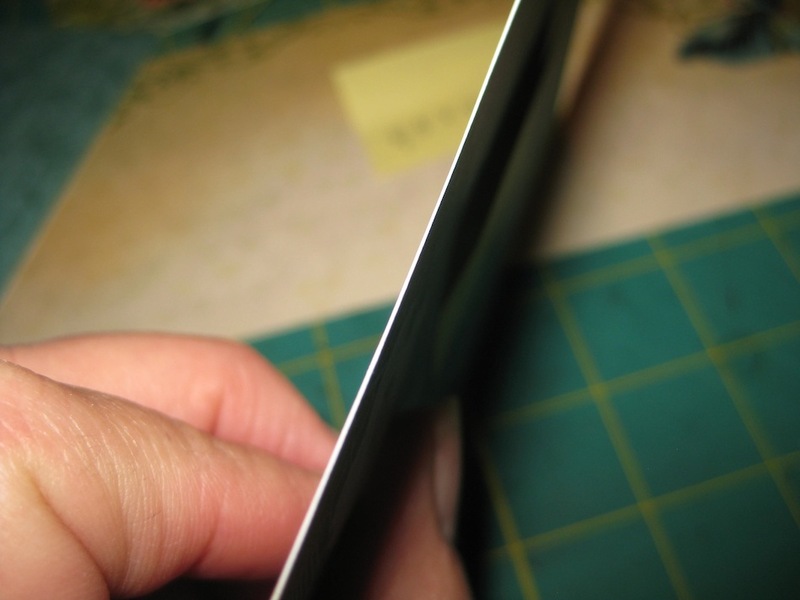 I took the full measurement of the side to be covered then subtracted 1/4 inch from the measurements. Once I had all the measurements of each stinkin’ surface. Inside and out. I had to make a decision which paper I would use. 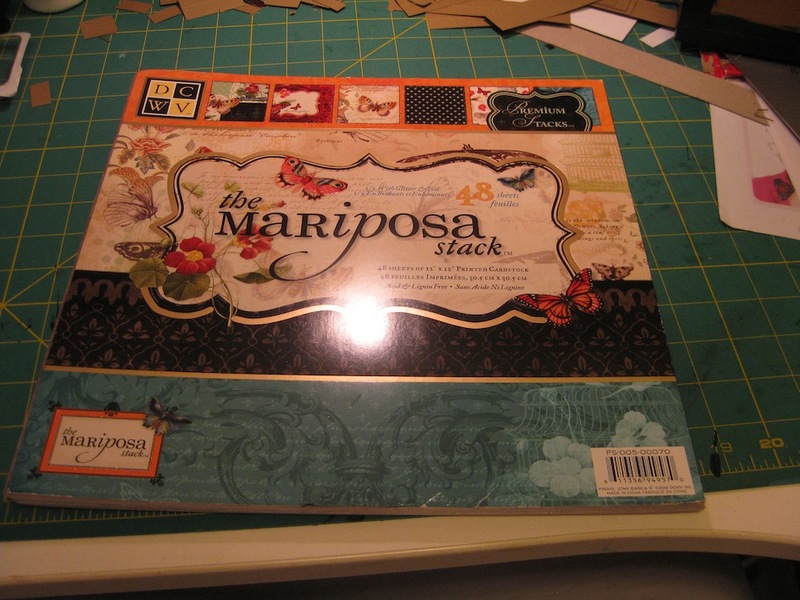 I chose DCWV’s Mariposa Collection. 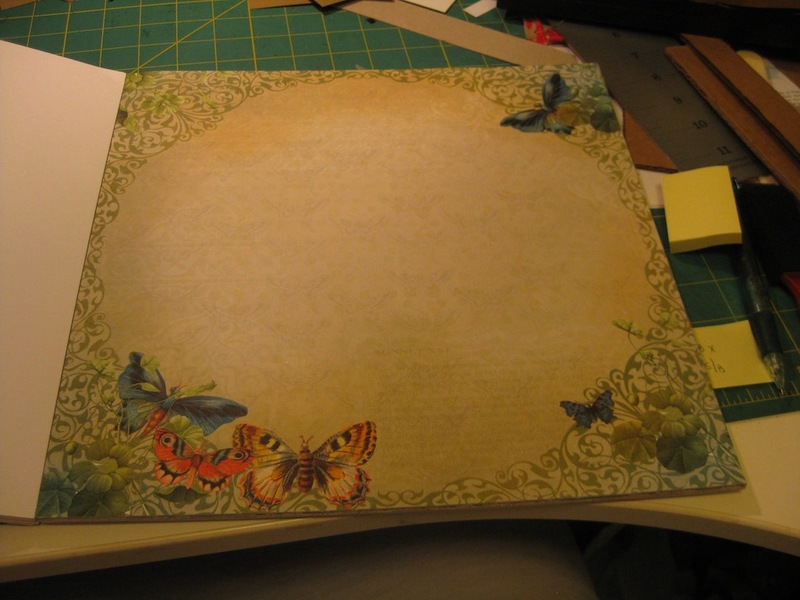 I really like the butterfly images on this paper. And the swirly bits are my favorite as well. I chose this paper for the right and left sides of the box. 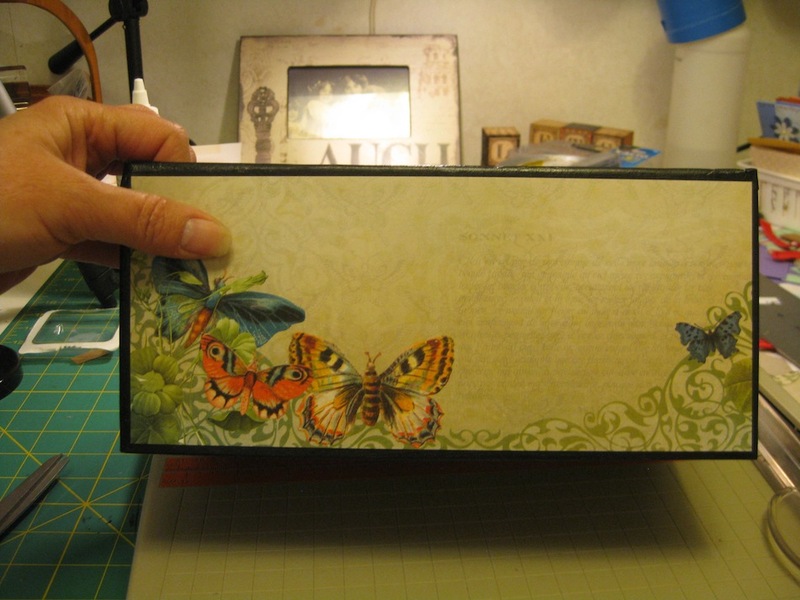 The butterflies on the top and bottom of the page are brightly colored and the swirly bits would look great along the bottom of the box. 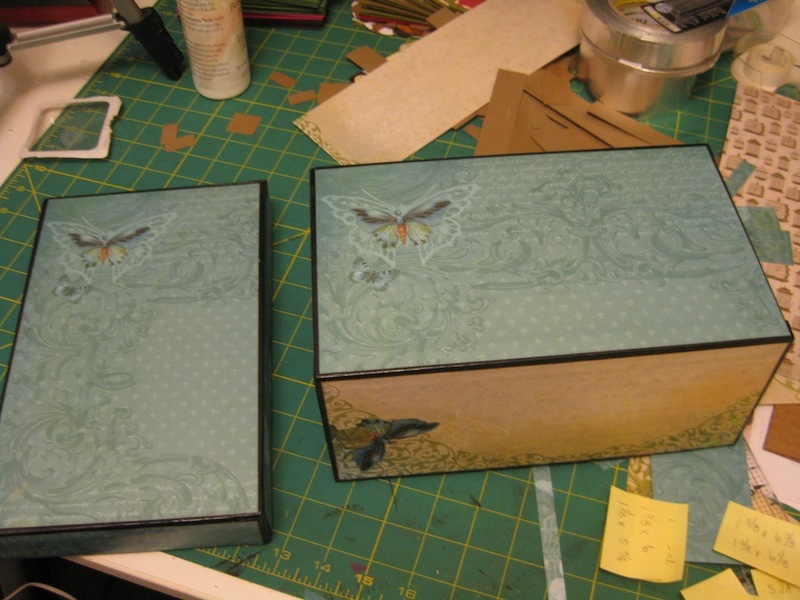 With the aid of my favorite paper trimmer, the Tonic Studios Guillotine trimmer, I cut the paper for the right and left sides of the box. Using the bottom set of measurements on the box sides for my cutting guide. 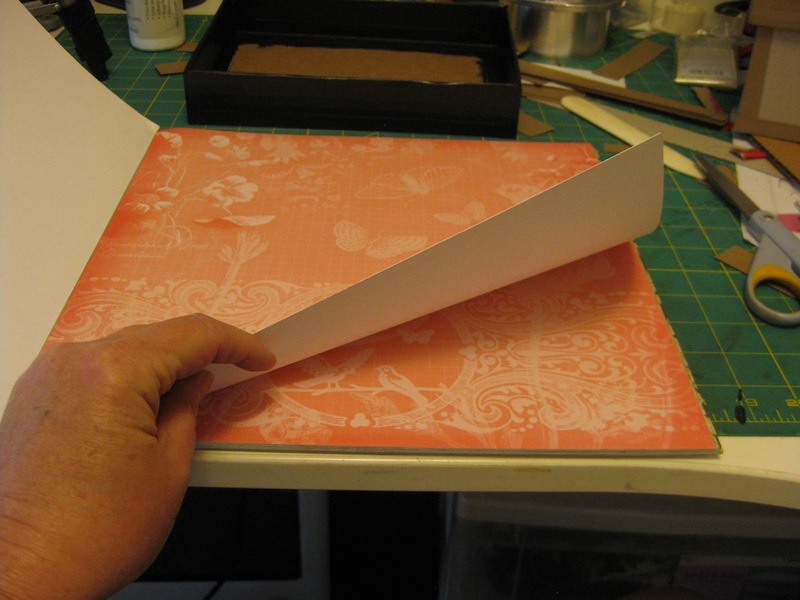 I have used the second sheet of this paper on some other project and had to find something in the paper stack for the top and bottom of the box. I haven’t glue these papers on yet. This is just the “test fit” stage. 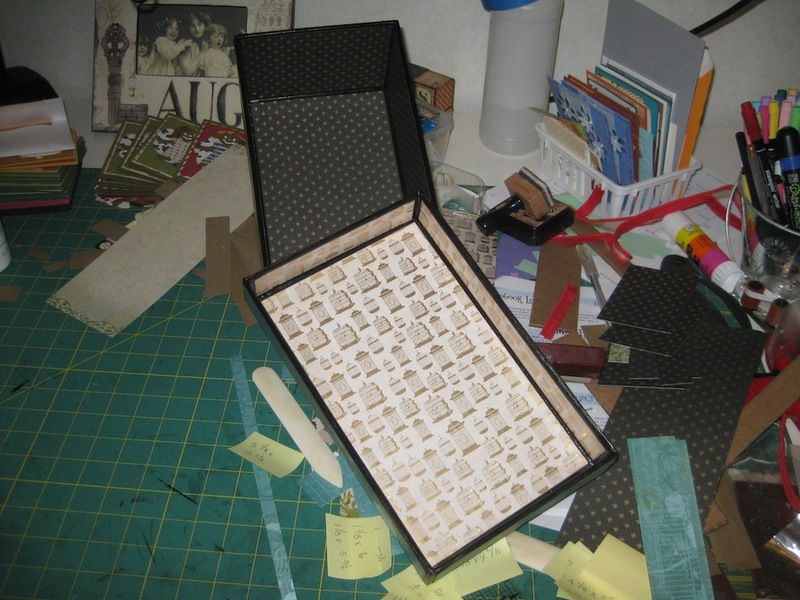 Once that part was finished I had to work on the inside of the box and the inside of the lid. 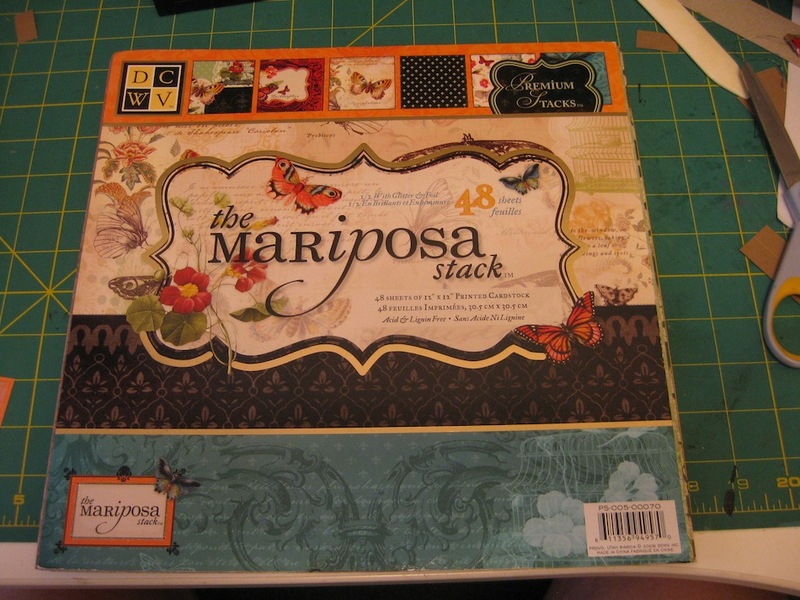 The papers are from the same DCWV Mariposa Collection. I had only one sheet of each of these papers. 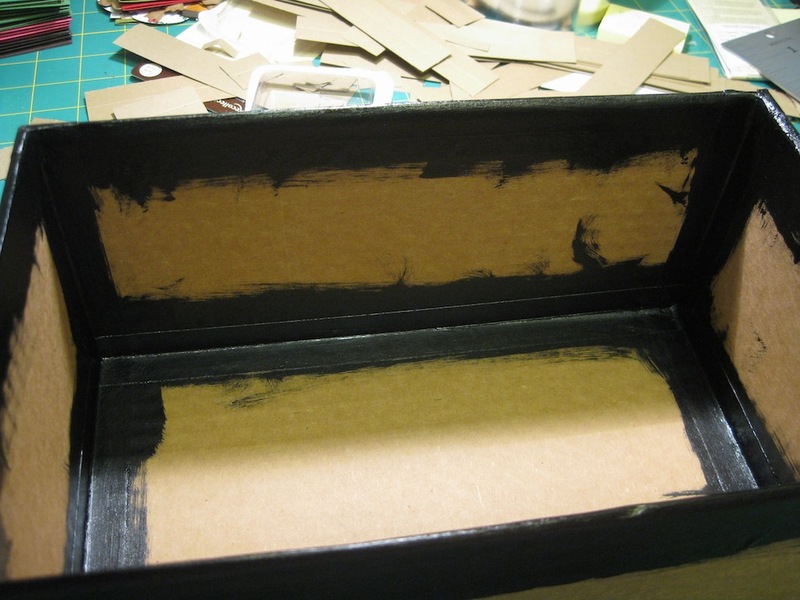 This box will now sit for a day or two to allow that acrylic paint to fully cure and the glue I used to attach the paper to fully dry. I test fitted the lid to the box and ended up with a sticky situation. 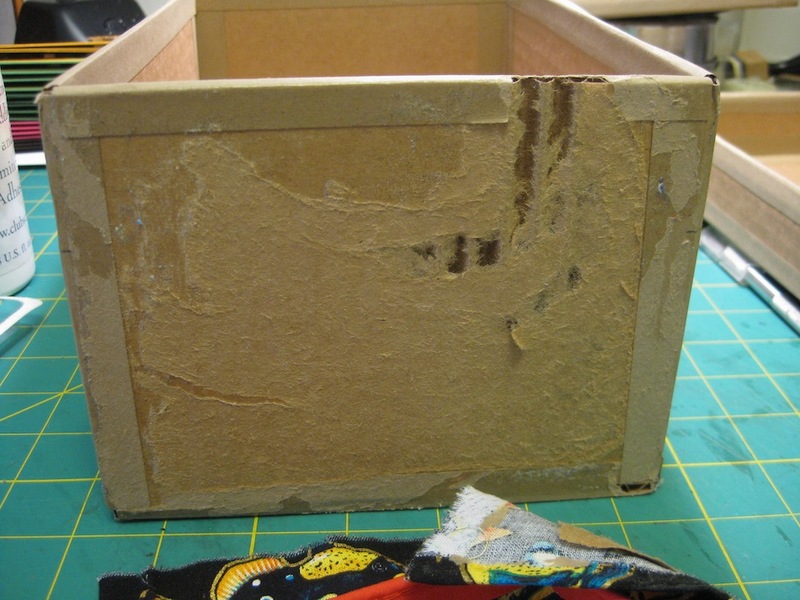 I had to work at prying the lid off the box and checking for damage done in my haste. 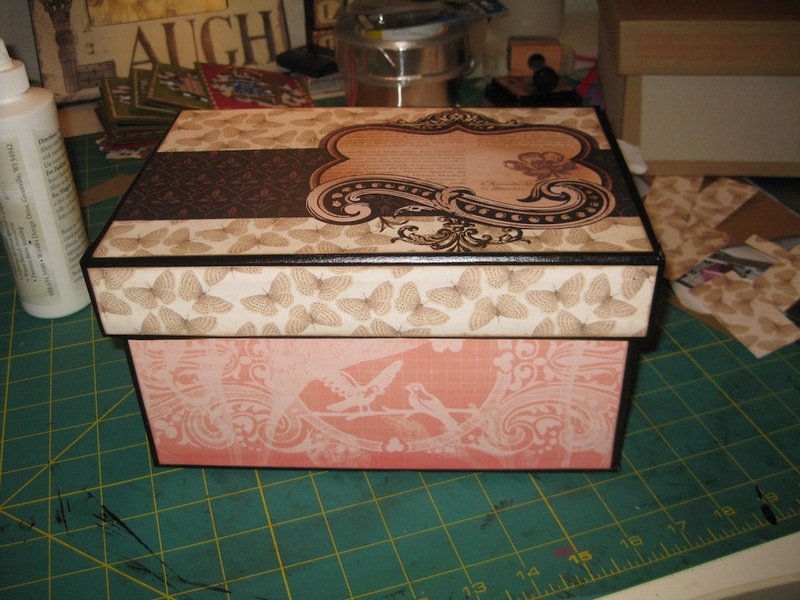 Now I’m contemplating if I need to add some rhinestones, flat backed pearls, and some lace to the box and lid. I’m torn between leaving it as it is or blinging it up. As you can see. 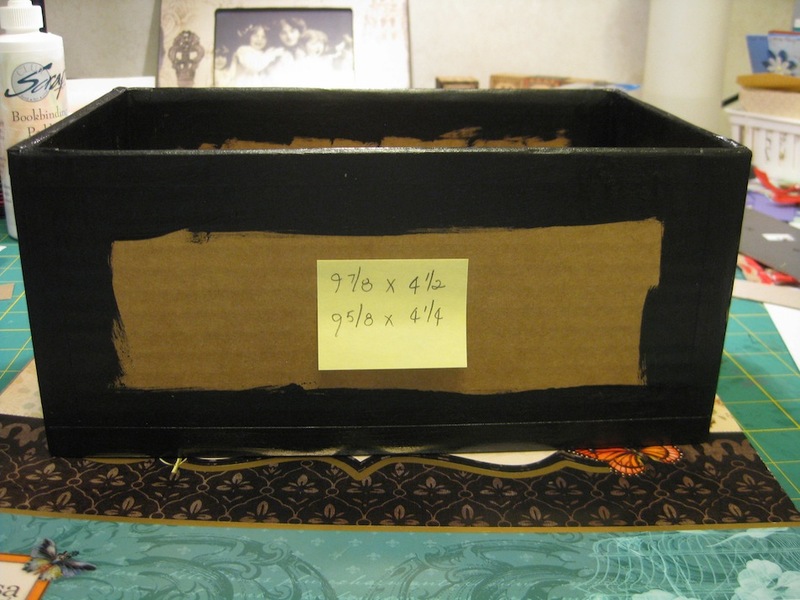 The black paint applied in such a messy fashion has “framed” the papers well. One other thing. This paper has a white back to it. 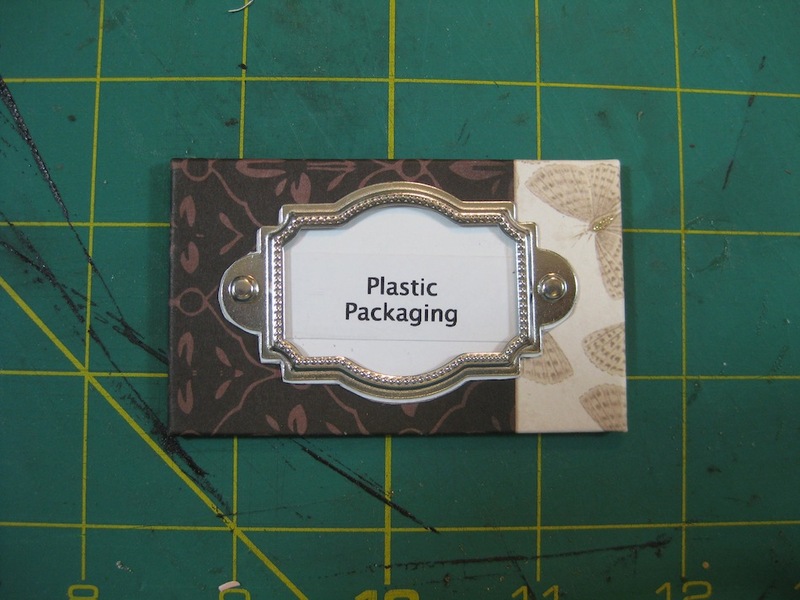 It is not double sided decorative paper. 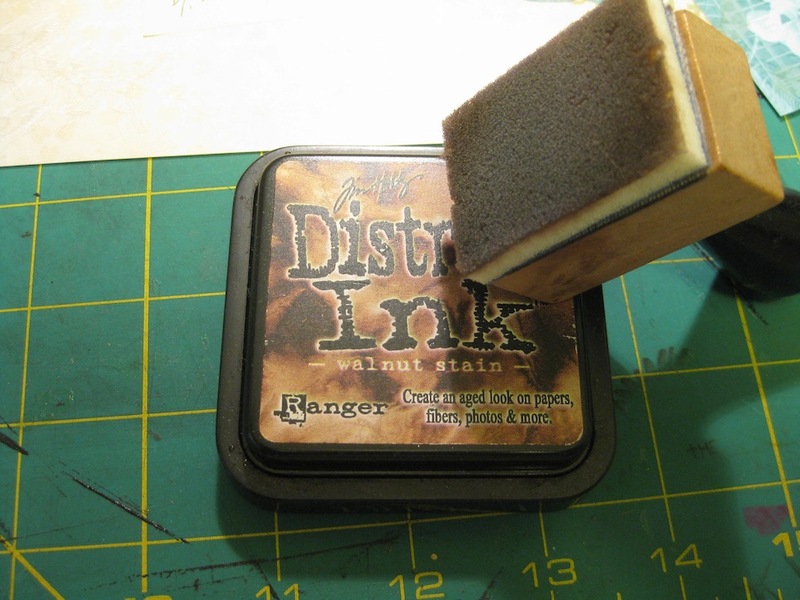 After cutting the pieces I had to use some Tim Holtz Walnut Stain Distress Ink to the edges of the paper to hide the white edge. I can add “Illusionist” to my many talents 😀 Well…..maybe not. The untold story of perfect art projects. For new art creators, newby crafters, the inspiring YouTube videos speak to your creative soul. You watch several videos and get so stoked. Totally excited to take on the world and show the people in your life just exactly how totally AWESOME you are. 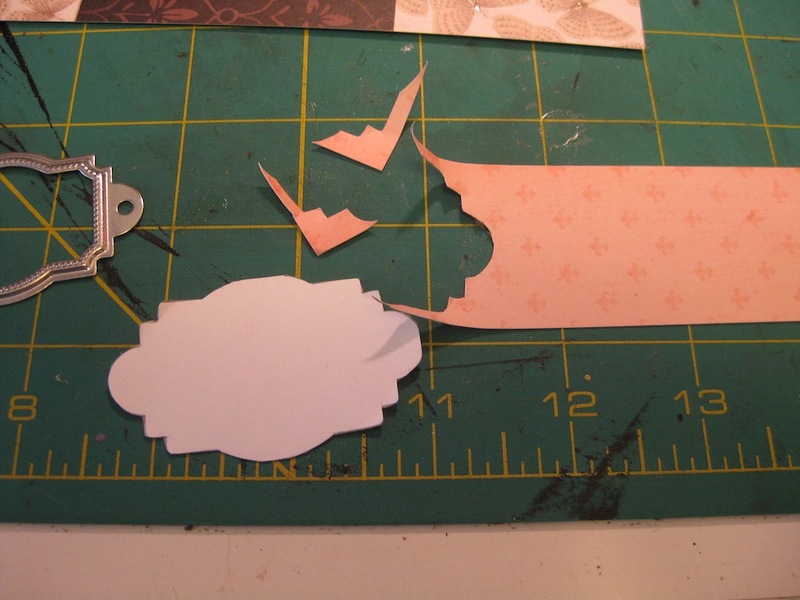 Some of the videos come with Step-By-Step tutorials to break down the process. Other videos show you the finished product then explain the tools and products they used. 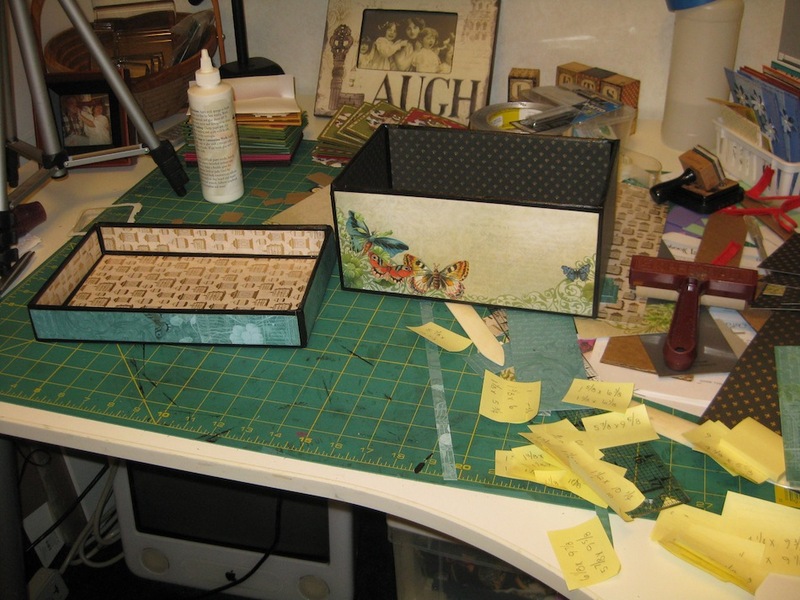 I am not a “newby crafter” but I am not a “seasoned crafter” either. Believe me…I get just as frustrated as you do when my creations FAIL. I have had some epic failures. 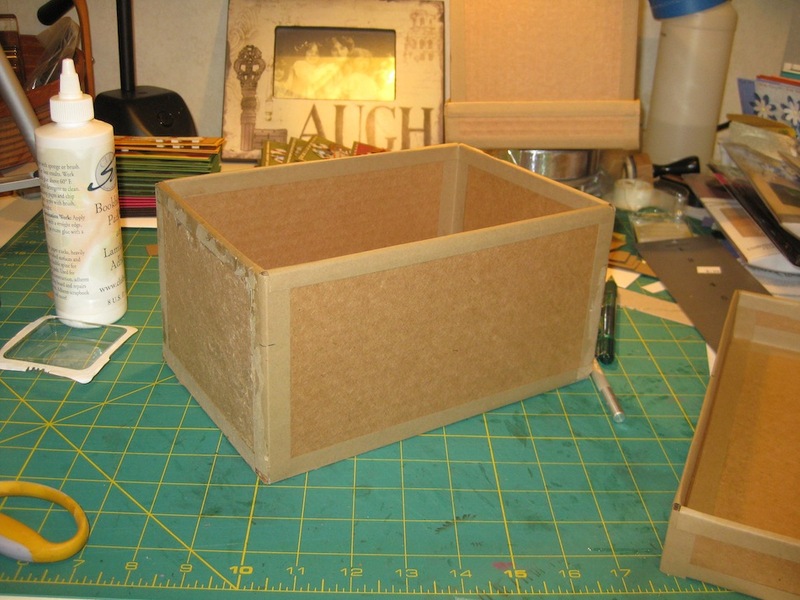 I’ve been watching some YouTube videos on creating storage boxes from chipboard. The person I like to watch is “ozegran“. Her videos are very inspiring…to me anyway. I have a mechanical bent to my personality. 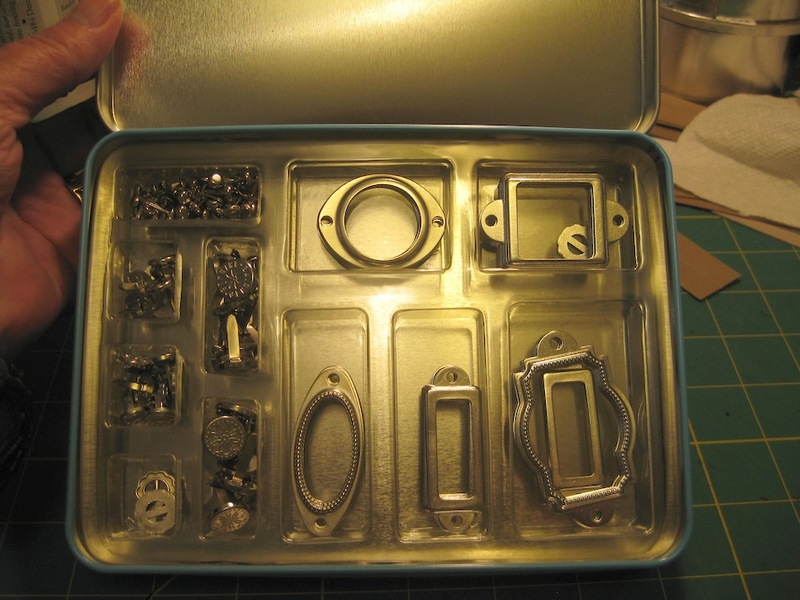 I get so excited when I see someone make useful products out of plain old stuff. This woman is from Australia, I think that is where the “OZE” part comes from. Get it Aussi….OZE? 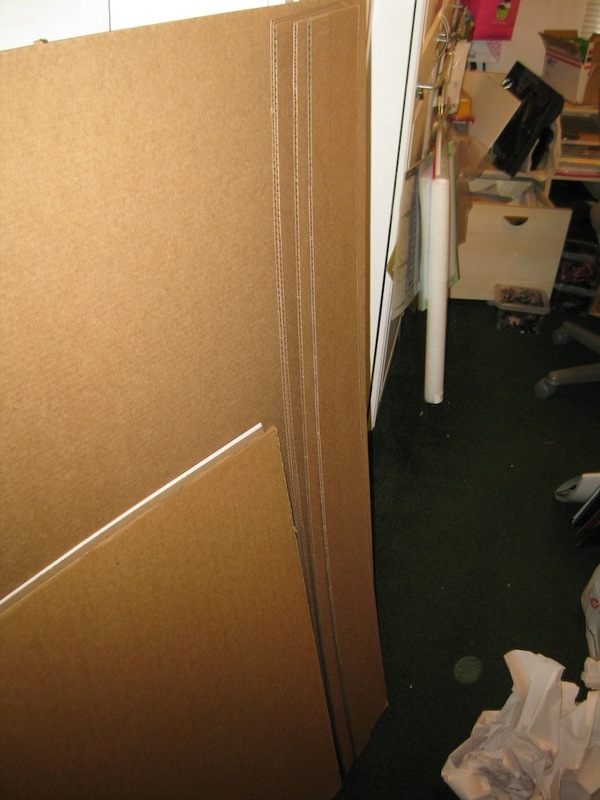 I don’t have ready access to large sheets of chipboard but I do have access to corrugated cardboard. 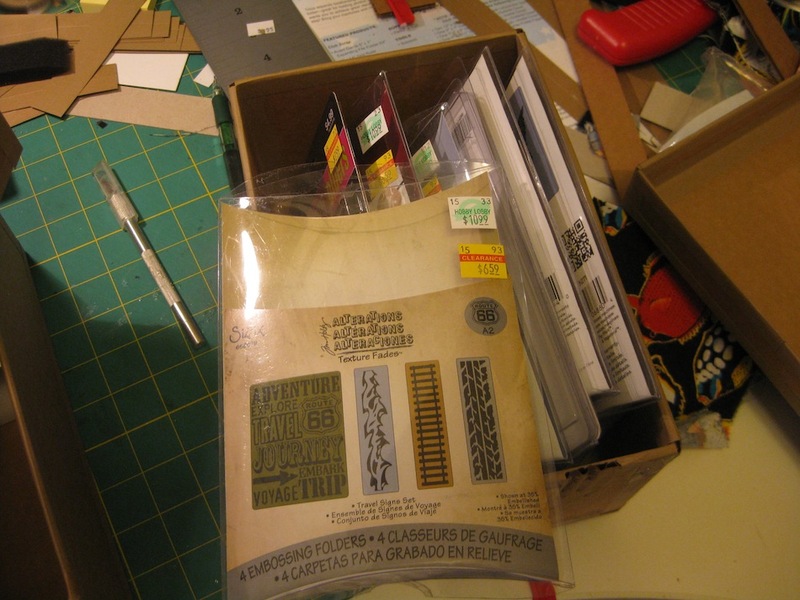 I purchase sheets of corrugated cardboard from my local Budget Box and Bag store. 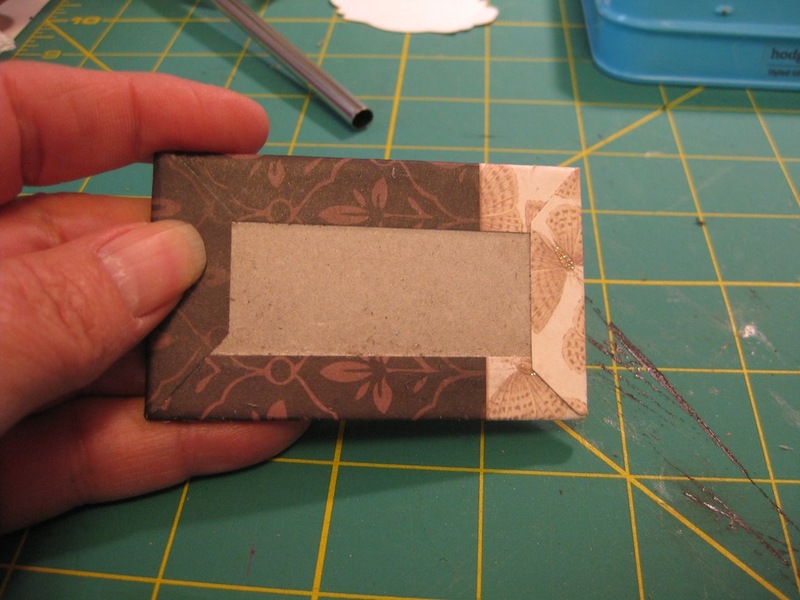 Jim, The Gentleman Crafter, has a video on making “Structure Strips“. 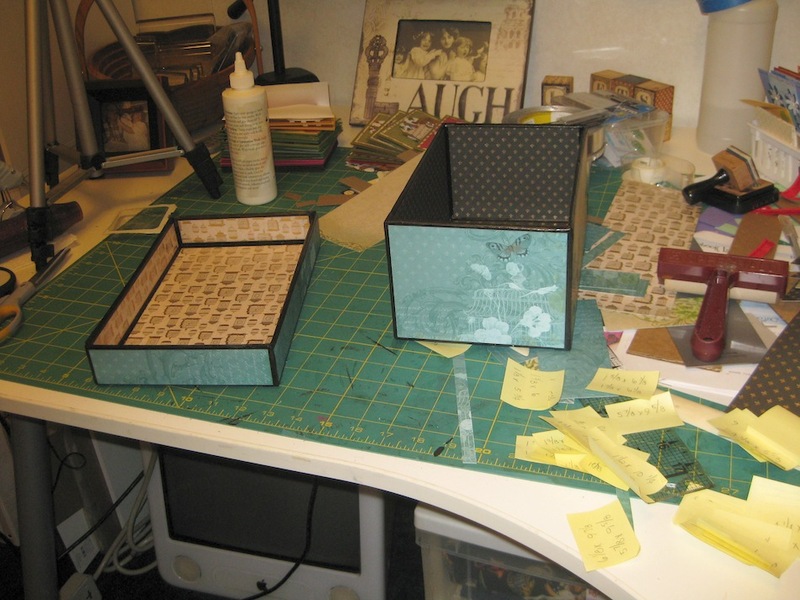 Spending time watching these two crafters I knew I could make a box to store the greeting cards I have made. Now they sit on my table and are in danger of getting damaged. 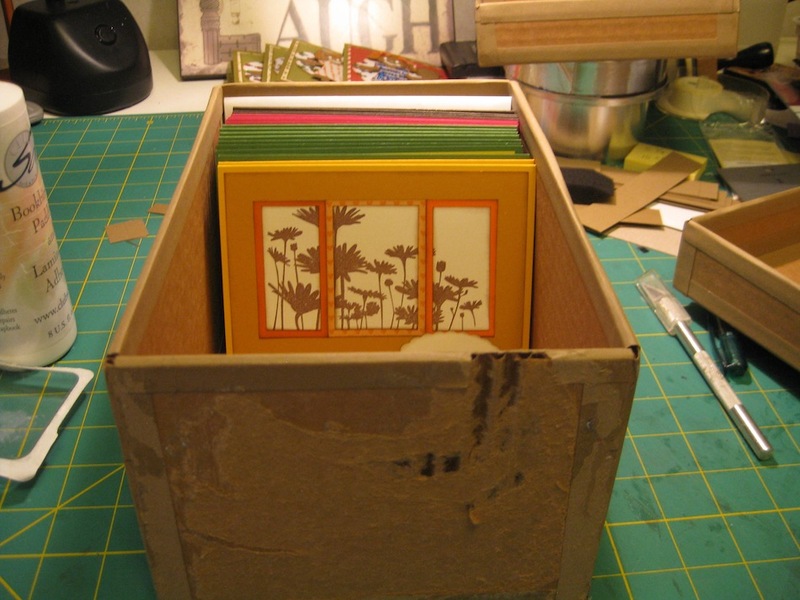 The last two weeks I was out on the road doing my “Day Job” I had plenty of time to think about building a box to store my cards in. I got so excited!!! 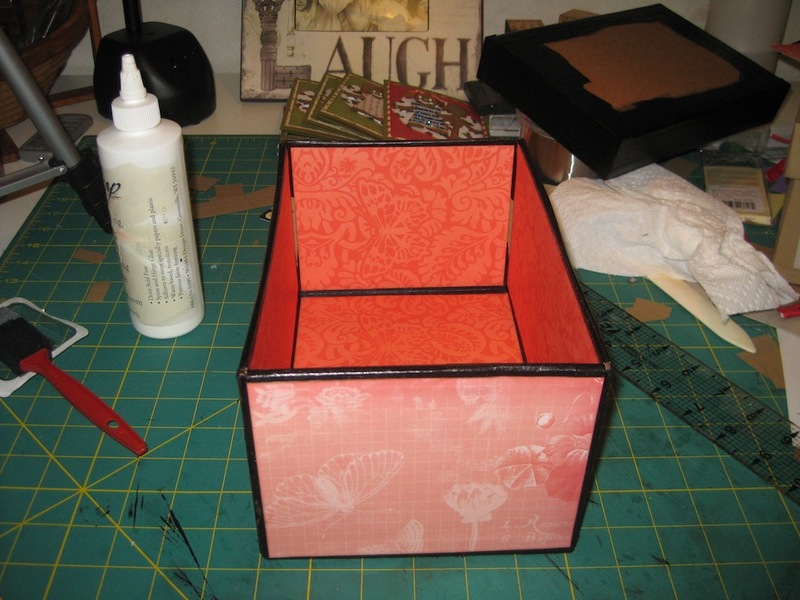 I could picture the finished box in my head. Covered with bright fabric. 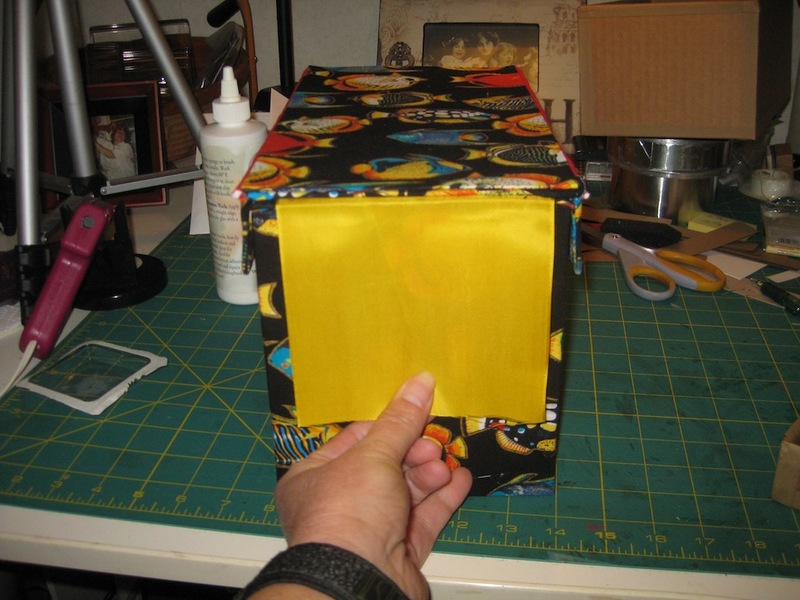 The edges would have piping on them to make the box look like no other box out there. 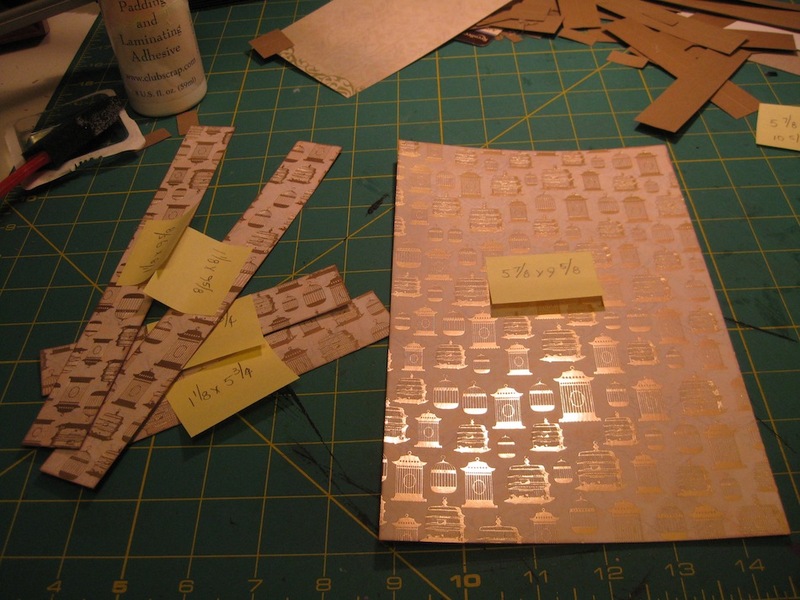 Monday I went to Michaels and purchased some chipboard. 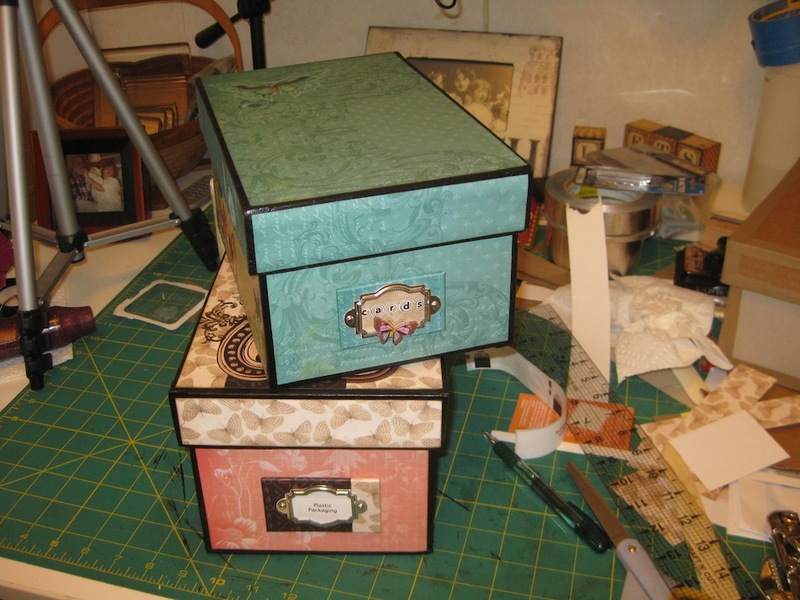 Tuesday I got myself into my craft room and began creating the box I had in my head. 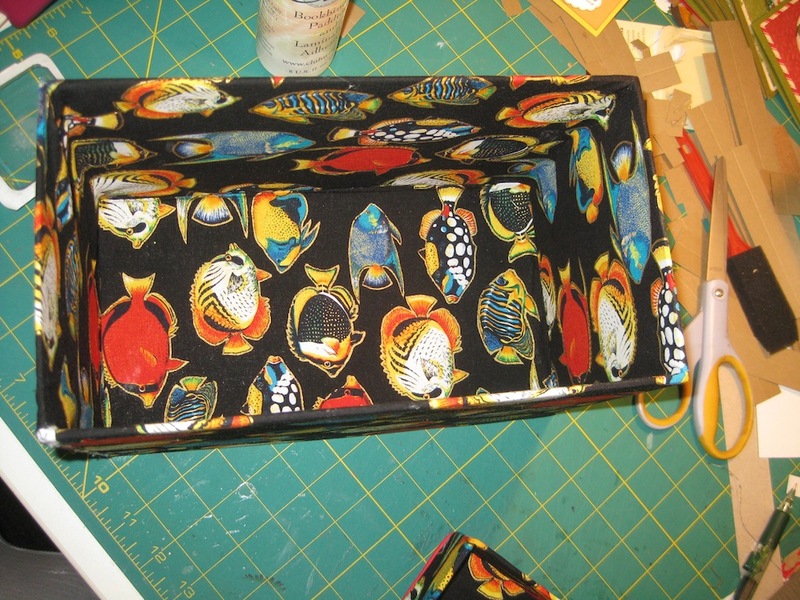 Inside of fabric covered box. Crapazoid. 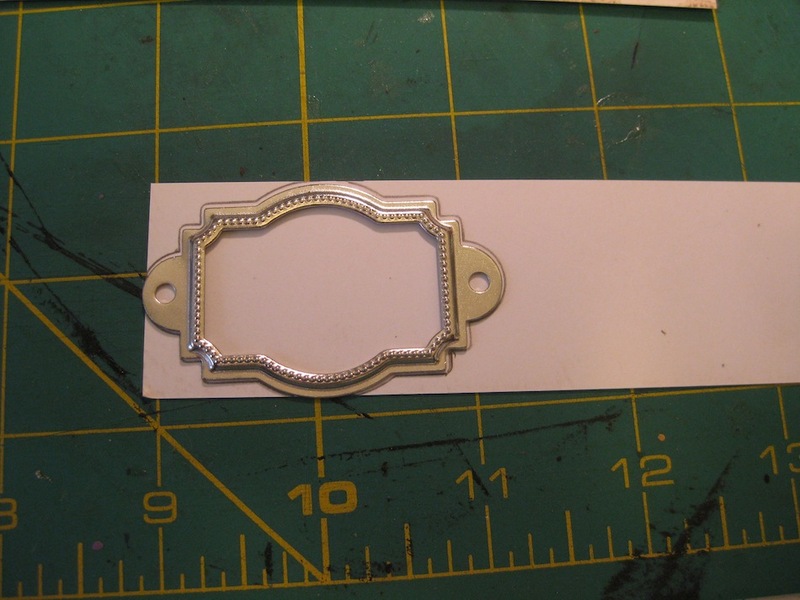 Don’t know how to attach it. 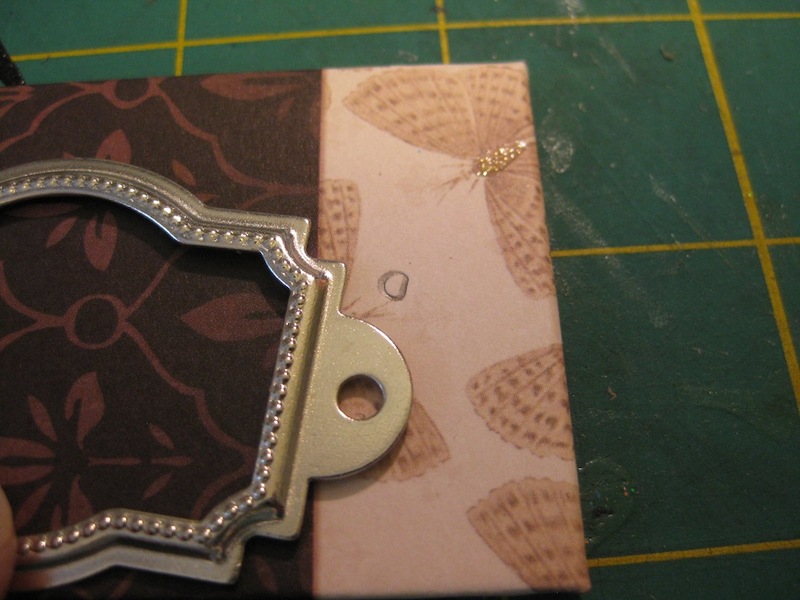 Trying out the embossing folders. 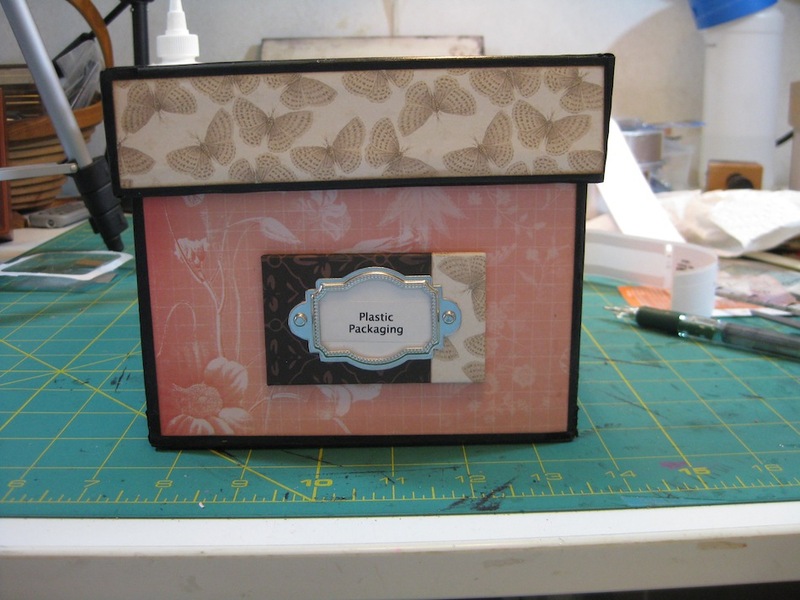 I created a second box that would be just the right size for my cards. 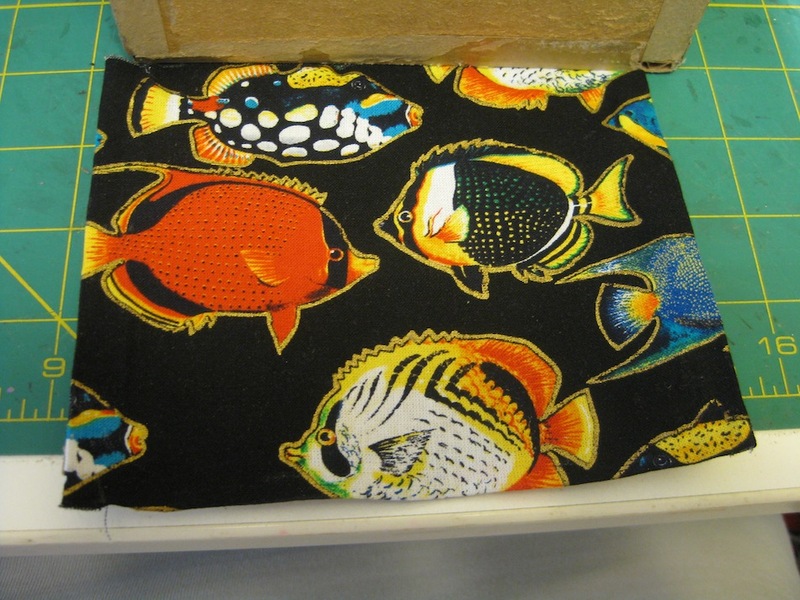 This time I was going to get the fish fabric to be right side up. I cut only the front and back panels to test my theory out. 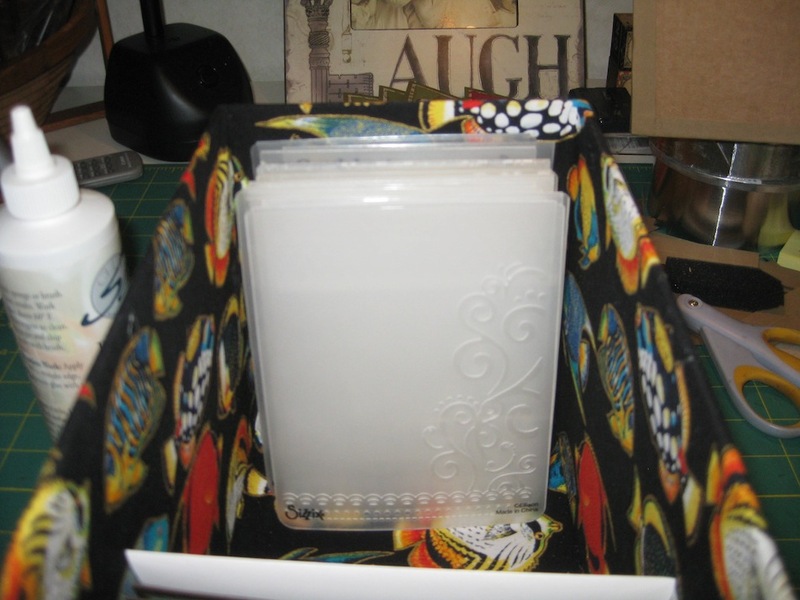 Well….that went all pear shaped And the lid….that was a catastrophe. The lid was too big. The cards FIT! Yippee Skippy! 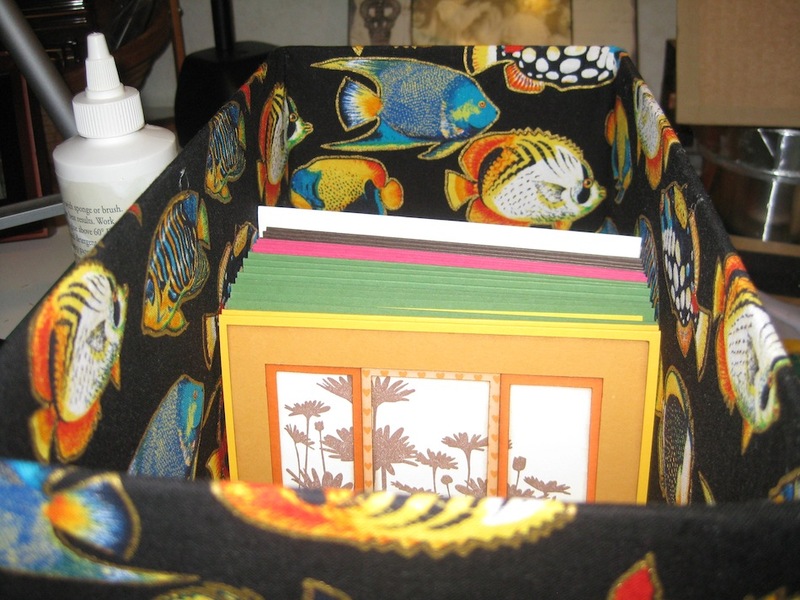 Having the cards fit in the box was a major WOO HOO for me. Success! I was totally stoked. 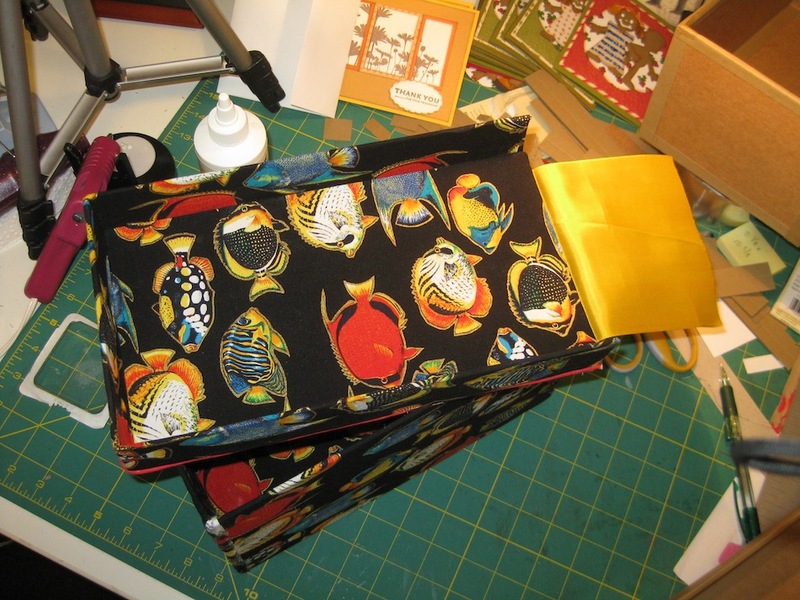 I cut panels of the fish fabric to fit on the front and back end of the box. 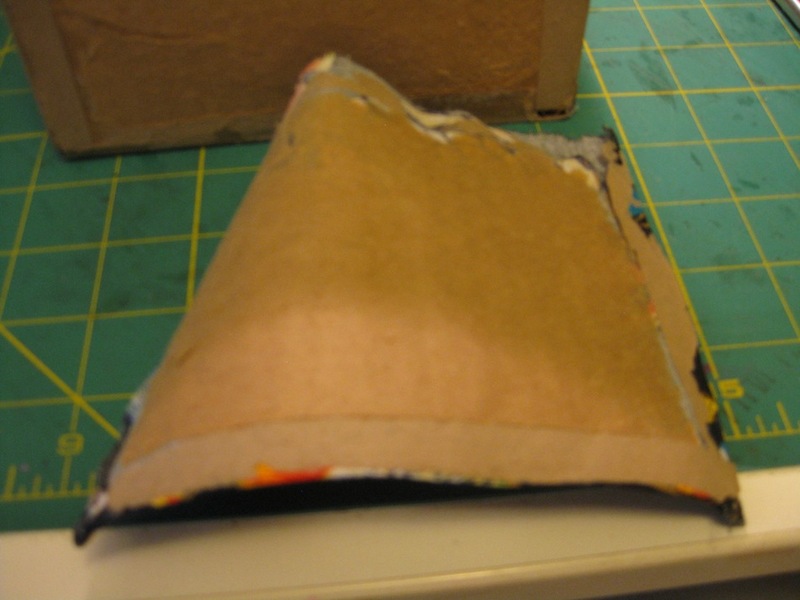 Fabric panels cut to fit. 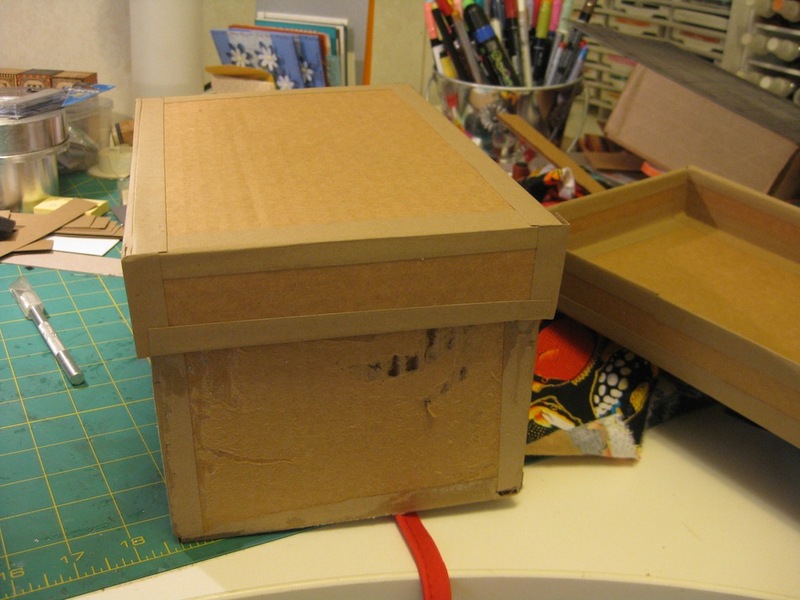 I cut strips of upholstery piping to be attached on the edges and bottom of the box. Upholstery piping for a pop of color. 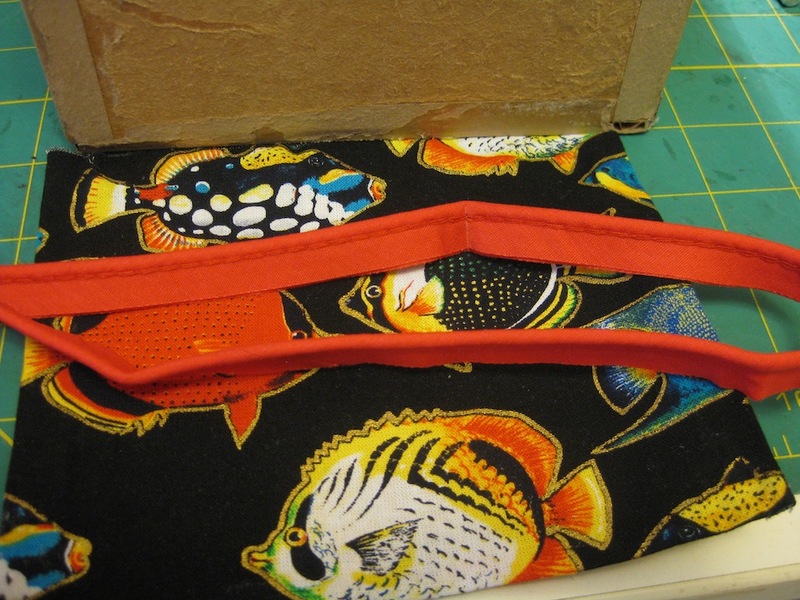 I glued the fabric on wonky and the piping only pointed to the wonky fabric. Crapazoid the box shows through. So I tore it all off. 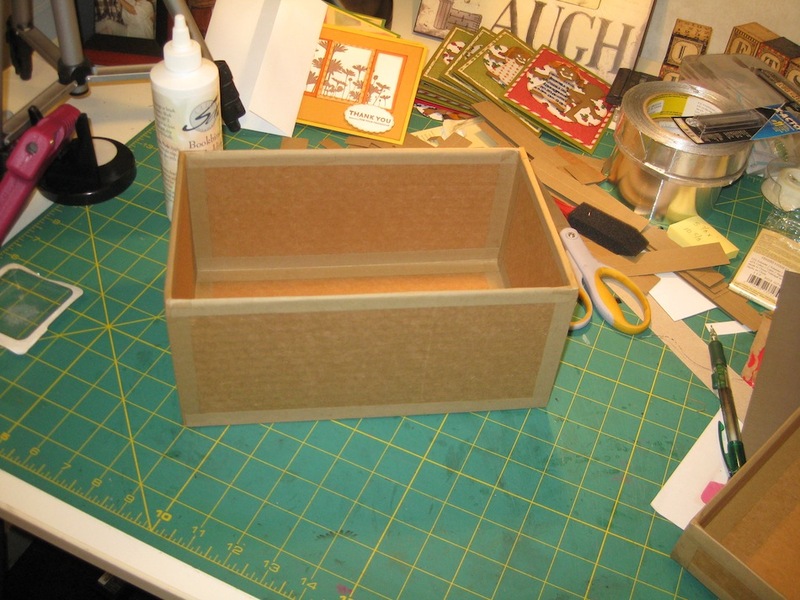 I did make a lid that would fit 😀 So now I have to fix the torn cardboard and do something else to this box. I think those plastic packages the embossing folders came in would fit in this poor box. YES! They do fit. Plastic packaging to be used later. And the lid fits snugly on the box. Woo Hoo! The new lid fits perfect. 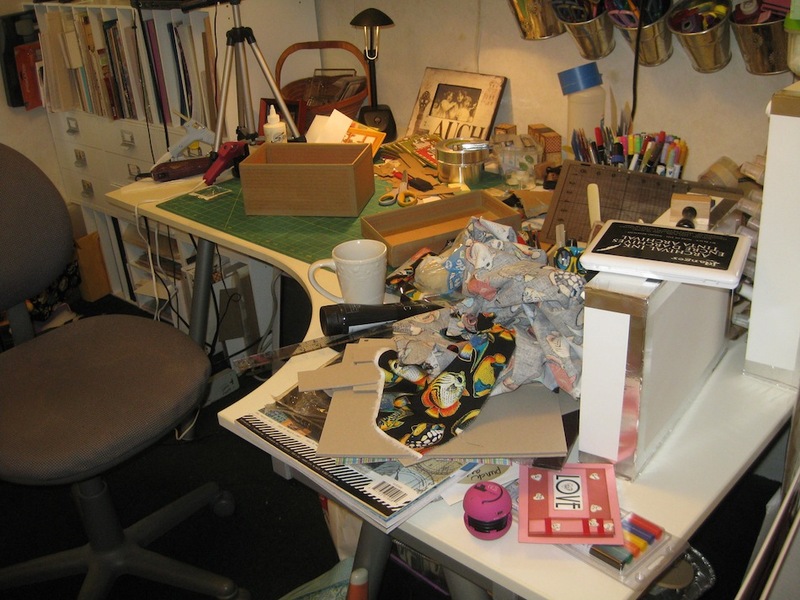 So now I have a serious mess in my craft room. One serious mess is happening here. Box #1 took over 8 hours to build. Because I didn’t know what I was doing. Box #3 took 4 hours to create. Lid included. The lid looks so good and I am thrilled with the whole box. 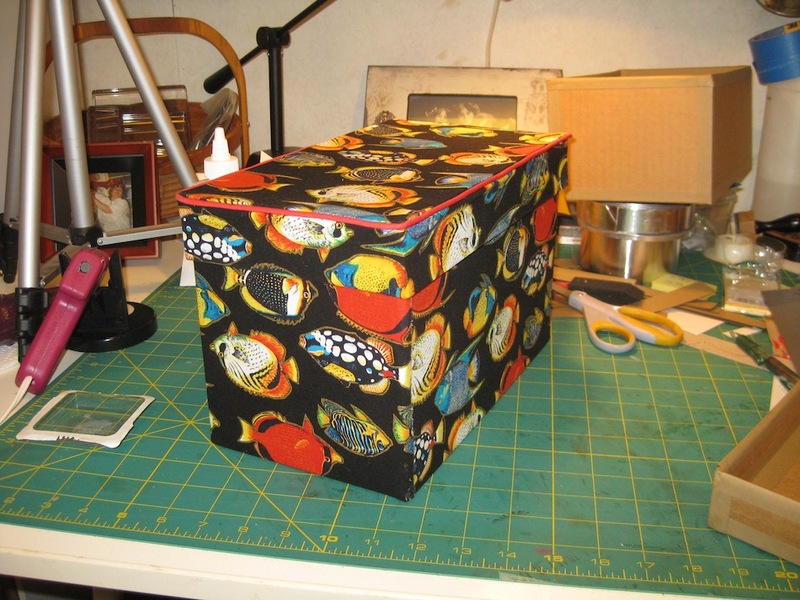 Just look at this awesomeness 😀 I won’t be putting the fabric on this box. THAT IS FOR SURE! So, in conclusion, this message is for new crafters….and not so new crafters. When you begin a project that you have never done before be prepared for the “Learning Curve”. DON’T STOP BECAUSE THE FIRST ATTEMPT FAILED. Learn from your mistakes. Make the necessary adjustments. Keep at it. Your head will be full of condescending voices that will tell you how much you stink at this. There will be soul crushing crap running full tilt in your head. See. I knew you couldn’t do it! Now look at all the stuff you have wasted! You don’t know what you are doing! Just leave it alone. You’ll never figure it out. Just look at that junk you have made. Other people can do this better. Leave this “pro-ject” to someone that knows what they are doing! Seriously. You have wasted time that could have been better spent on washing dishes! DON’T LISTEN TO THE VOICES IN YOUR HEAD!!!!! It took me three tries to make the box correctly. 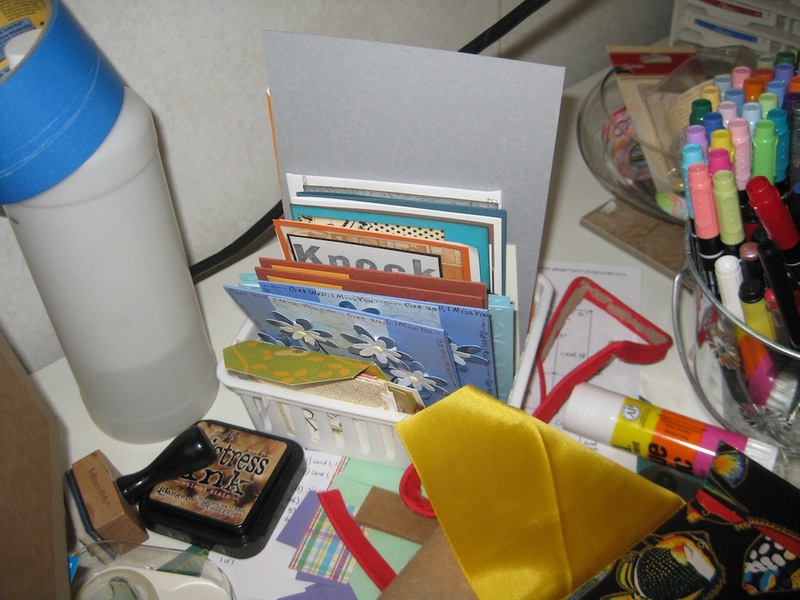 The two “Failures” are going to work just fine for me in my craft room. AND BEST OF ALL!!!!! I MADE THEM. ALL BY MYSELF!!!!!! Take that you dirty birds! Stick it up your nose with a rubber hose you rotten voices!